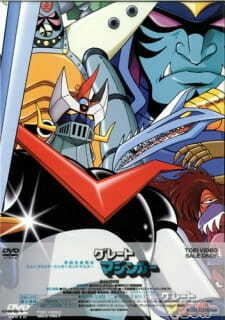 Great Mazinger is a fun follow up watch after Mazinger Z, but it is not quite up to par with it. That's not to say it isn't worth while though, it was still a good series. I'll do my best not to make the entire review a Mazinger Z/Great Mazinger comparison, but it was hard for me not to constantly compare the two since I marathoned them back to back. Plus, I don't really see why anyone would watch this without having seen Mazinger Z first. When the show first starts it's almost like you never stopped watching Mazinger Z. Mazinger Z directly transitions into this series and even introduces the new robot and some characters. Things pick right up and mankind's battle against the Mikene Empire continues, now with more of a focus on the Mikene Empire rulers themselves. Gorgon returns as a recurring henchmen, and Boss and his crew stick around with Boss Borot. Kouji, Sayaka, and Professor Yumi are absent for most of the series. Tetsuya Tsurugi is the new protagonist and pilot of Great Mazinger. He's a very manly character and one of the highlights of the show. You'll see him doing plenty of hand to hand combat, as well as driving around a motorcycle that can use rocket punch. Jun Hono replaces Sayaka as the female sidekick. Watching these two characters interact is quite a bit different than watching Kouji and Sayaka, Tetsuya and Jun are far more responsible and mature. There is little comedy that goes on between them, something constantly around in Mazinger Z. Boss is goofier than ever though, so the comedy still makes it's way into the show. The new professor character is Kenzo Kabuto, who is actually Kouji and Shiro's biological father. Supposedly he is a much grizzlier character in the manga, like he is in Shin Mazinger, but here he's mostly a collected leader and acts very similar to Yumi. The new cast is good and gets the job done, but the chemistry that Kouji, Sayaka, and Boss had is irreplaceable. One area I thought Great Mazinger was particularly lacking in was the henchman department. You gotta have good henchmen to make a good episodic robot show. The Ankoku Daishogun (also introduced at the very end of Mazinger Z) was probably the most memorable one, but even then he paled in comparison to the legendary cast of henchman in Mazinger Z. Gorgon returns, but he is ultimately under-utilized. The character design of the henchmen is whacky, creepy, and sufficiently Go Nagai, but there are too many of them and none of them really stick out. There were like a dozen of them and most of them look and act the same. Eventually I had a hard time keeping track of who was who, and then eventually just stopped caring. Aside from Gorgon and the Ankoku Daishogun, there was a surprise henchman that was kind of cool to see, but you'll have to see that for yourself. Music and art is basically on the same level of quality. Like Mazinger Z, there is really classic old school insert songs galore that you find stuck in your head and anticipating. Somehow these songs never get old and always bump your attention level up. Most episodic robot shows have a song or two that always plays during the pilot docking/combination sequence, but having a vocal theme (other than the OP) that always plays is something pretty unique to the 70s Mazinger shows. As I said before, art is pretty much more of the same thing, which is a good thing. The apocalyptic red skies that are always in these old monster of the week shows are present and the cool 70s art is pleasing to watch. Great Mazinger has it's own repertoire of attacks, most of which are based on Mazinger Z's. Great Mazinger has a sword though, so that changes things up a bit sometimes. One of the best and most memorable episodes was a brutal sword fight with the main henchman. Plot wise, there really isn't all that much to talk about or criticize. Little happens in the way of plot aside from the beginning and the last stretch of episodes, but I will say that the last stretch of episodes were very good, it was a satisfying ending for sure. Something that made Mazinger Z so unique was how Kouji had to start from scratch and learn how the use the machine. I remember thinking that the show was more in-depth in training the pilot, showing his development, and explaining the cockpit more than any Gundam show I've watched. With Great Mazinger though, Tetsuya is already a trained expert so there is no development with him really. The other major difference, which I kind of alluded to a little bit while talking about the characters, would be the tone. Everything is more "serious", mainly due to the leading characters being more stoic and professional. Sexual jokes are toned way down, and the only humor we really get is through Boss' crew and this bizarre supporting character that is an annoying talking Crow. I should note that having Boss around is really one of the show's greatest strengths. It was probably my favorite part of the entire thing if I'm being honest. So if you enjoyed Mazinger Z it only makes sense to give this a shot. You may not like it as much, but it's a solid sequel to one of the most successful mecha franchises of all time, and perhaps worth watching for that reason alone.